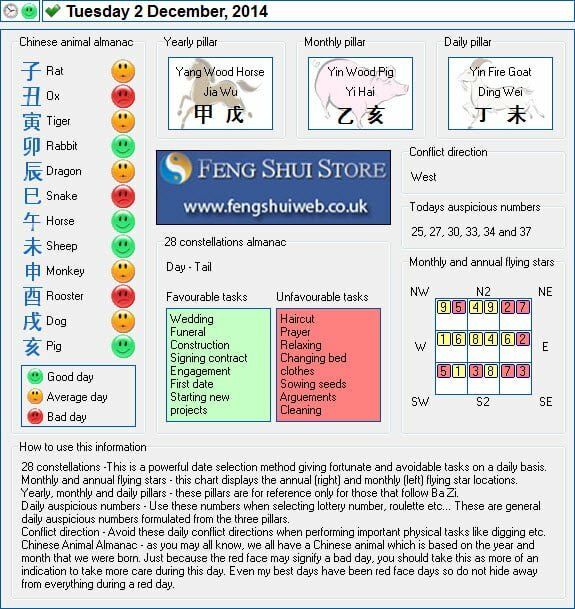 Here is the Free Feng Shui Tong Shu Almanac for Tuesday 2nd December 2014. Hi, Danniel, i know you havent done monthly flying stars for december yet, i just wanted to know what to put in the east this month as my front door is here i have your 2014 kit, other sites are saying to put 6 metal wind chime here and no bright lights which is my next question as its xmas i always have lights out side they are the waterfall blue ones so would that be okay. The blue lights are water coloured so that can help disipate some of the earth energy this month which is good. I hope you have a fantastic Christmas and New Year Collette.